The star of the day was the Gilbert Water Ranch and not just because of the two Ruddy Ground-Doves we easily located. #178 for the year and the third Category 4 or higher bird of the year (photo by Barbara Amato). The Gilbert Water Ranch Riparian Preserve is the home to Sonoran Mud Turtles, Ring-tailed Cats, around two dozen dragonfly species and lots of birds. We had over 800 Least Sandpipers, five other shorebird species and 52 bird species in all. 110 acres in size, there was some sophisticated planning in the design and construction of this jewel in the desert! The facility is open to the public dawn to dusk. 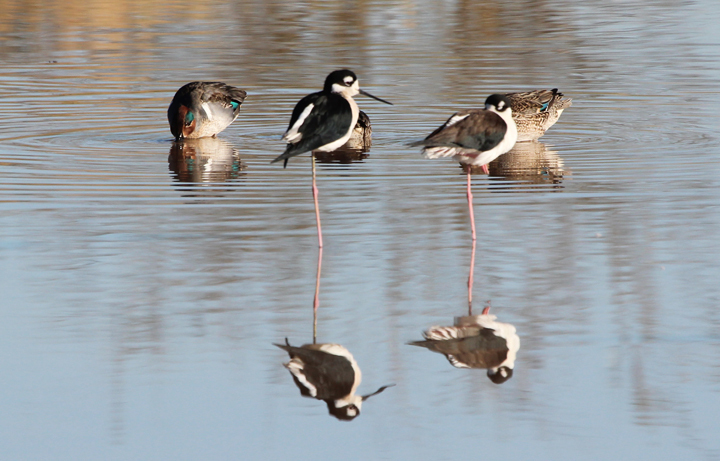 Nice shot of the teal and stilts. Great blog-I can’t belive you have already seen more than 150 birds. Don’t forget to give me credit for coining the phrase Quest for a Thousand ! There goes John, 1,000 miles from home and what shows up outside his door but a Tufted Duck (code 4 on his list, I think)–not more that 8 miles from home! Plus it is a one-day-wonder–by the next morning everything freezes up and it is gone. And here is more bad news, John is still away and on this Saturday I’ll be going up in the mountains with good buddy Ted Floyd where we are sure to see stuff like Pine Grosbeak, Evening Grosbeak, all three Rosy Finches and probably even Eared Grebe. Who knows maybe this will be another Dusky Grouse year. You better be racking them up down in the valley, that’s all I can say.